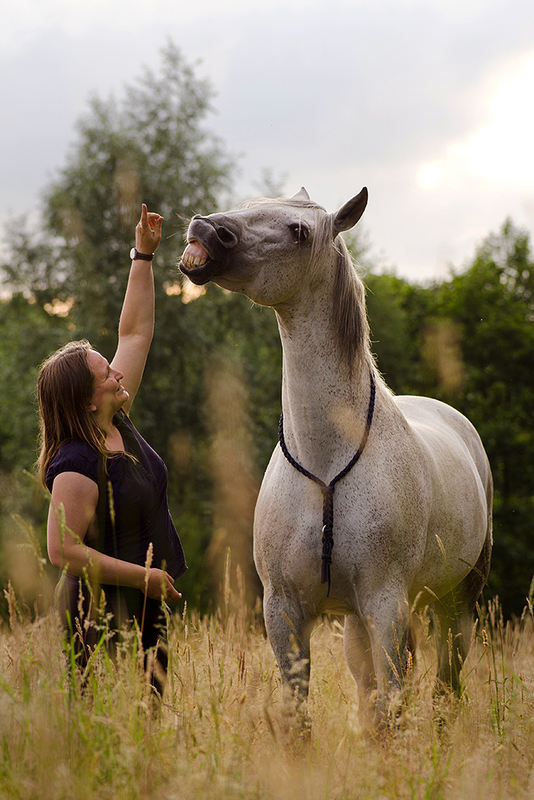 Clicker training depends on the enthusiasm of its supporters, and on all the small moments of success. 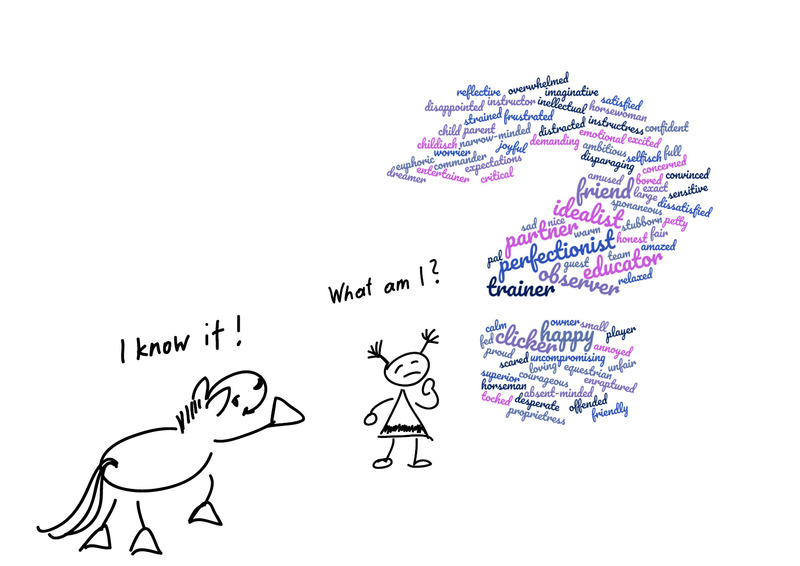 However, strong emotional attachments to a certain training theory can also cloud our critical self-awareness. Which limitations and variations have already developed within the clicker community, and which impulses from other training methods are allowed to influence clicker training at all? We always run the risk of becoming too comfortable in our little chamber where only echoes are heard but other opinions, perspectives, and explanatory models are almost automatically filtered out. We keep searching for answers to important questions. We will not find them spontaneously. We need time and peace. Today we are getting a bit more serious at R+. We are going to ask a couple of questions that cannot be answered in a spontaneous way but require peace, and time, and courageous self-reflection. We would like to encourage you to reach deep down inside yourself, and reflect profoundly upon your own motives even if you might find it difficult, and even if it hurts. 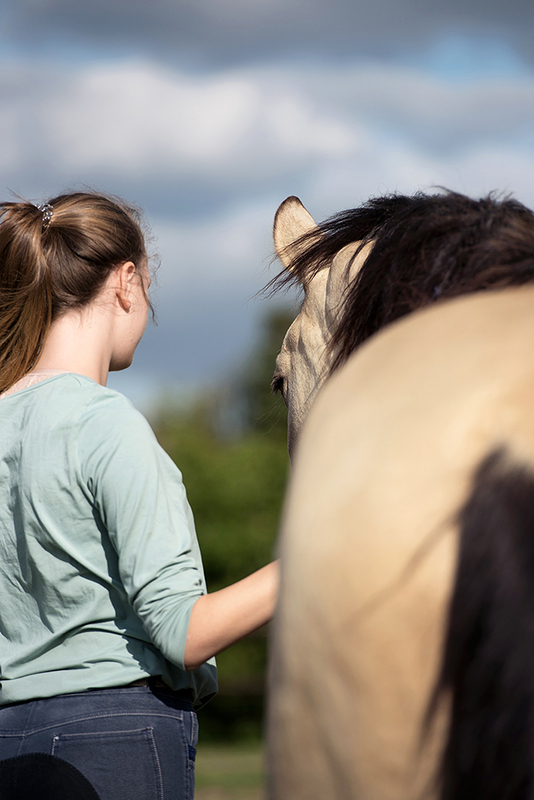 This is because the pain and discomfort you might experience can become valuable guides on the way towards authentic togetherness with your horse. Enthusiasm for clicker training easily leads one into the conflict zone between “pure clicker theory” and more traditional training methods. And before you can turn around you might find yourself caught in a process that is governed by hostility and justification because all too often people are quickly harping on about principles, do not contribute to the cause or to each other, and set a non-beneficial tone. However, instead of entering the heated debate we should rather critically reflect upon our own behavior: What is it that I am enthusiastic about, what am I fighting for, and what do I stand for? In other words, what is so terrible about the other or about my own previous history; what is it that burns me while I try to ignite a spark in others, or which parts of my past do I have to burn at the stake in order to do penance? What am I fighting for with the means that I criticize if others employ them? Of course, I only want the best for my horse, and I want to protect it from all the evil in this world; but maybe at the same time I forget to see that I might offend, accuse or ignore all the people who do not clicker (yet). However, there is always another way: I can also get involved with them instead of patronizing them. So, what is it that I am so enthusiastic about so that I do not notice that I am standing amidst ruins, that I am leading a battle for the sake of my horse, or that I only erect a monument of my good intentions. On a mission to converse? From time to time, most of us will probably choose a path like this one to feel a little better on our mission to become “better” persons. Yet, one needs to be cautious to not get blinded by the light so that one becomes completely blind to other person’s or the horse’s needs. It is an essential component of clicker training to address others who think in a different way in a friendly manner. What is more, people are not interested in persons who only exert pressure or polemically repeat their arguments. There is no single word that can comprehensively characterize us in all our doing if we are honest. Nobody is a clicker trainer alone for his or her horse, and we will mostly not be able to use the path of positive reinforcement alone even if we wish with all our heart. Maybe our skills are not developed enough yet, maybe we have not spent enough time and energy on thinking through long-term solutions, maybe we are not able to implement certain management measures, or maybe it is just something else that is more important at that time; and that is just typically human. We can only act in a systematic and well considered way within very limited boundaries. What is important, I need to be aware of the underlying mechanisms that govern how I act at specific moments, and understand why I have decided to act in this way at that time. Clicker training is a great tool but it is not the only method for training horses in a holistic and sensible way. Neither is it the only tool that uses the approach of positive reinforcement. 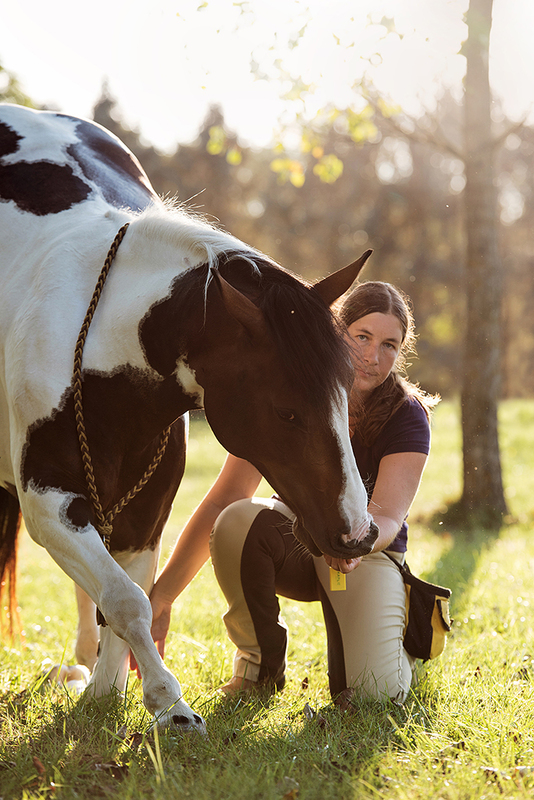 From our point of view, many different skills interact with each other when we want to lovingly train horses and foster a fruitful harmony between us and them. It requires knowledge about fundamental biological mechanisms, the horse’s behavior and its biomechanics as well as knowledge about different training methods, and about clicker training itself. This includes the knowledge of how to use relaxation techniques and typical conditioning processes but also the knowledge to choose a suitable cognitive training approach. Furthermore, it requires a strong empathic capacity, the awareness to step aside and leave the limelight to others as well as unbiased curiosity for the horse’s personality. The term “clicker training” alone is not enough for us here at R+. Both parts are not able to describe what we believe is at the core of our friendship with horses, and they cannot characterize our aims during work and spare time. The term “clicker” only describes a random marker signal or the use of a conditioned, positively connoted reinforcer. I as a person do not change and become better or more professional just because I go and buy myself a clicker. 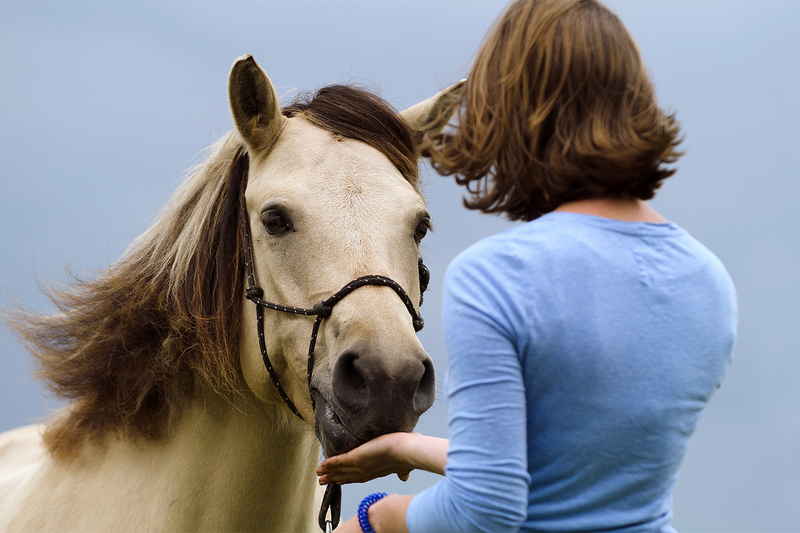 The clicker itself cannot distinguish between good and bad horse training. It can be very useful for specific areas but might not be of much use in others. So, it will be decisive to inform myself about typical clicker rules and regularities and other possibilities to work with marker signals, and to think about situations in which neither treats nor specific markers play a role. For us, it is not only about training, at least not in its narrower sense; so, we do not want to change our horse with our actions. We definitely do not want to initiate a conscious development process at all times. The term “training” was initially used in the context of training of horses before it was used in many different contexts from competition to school and sports. 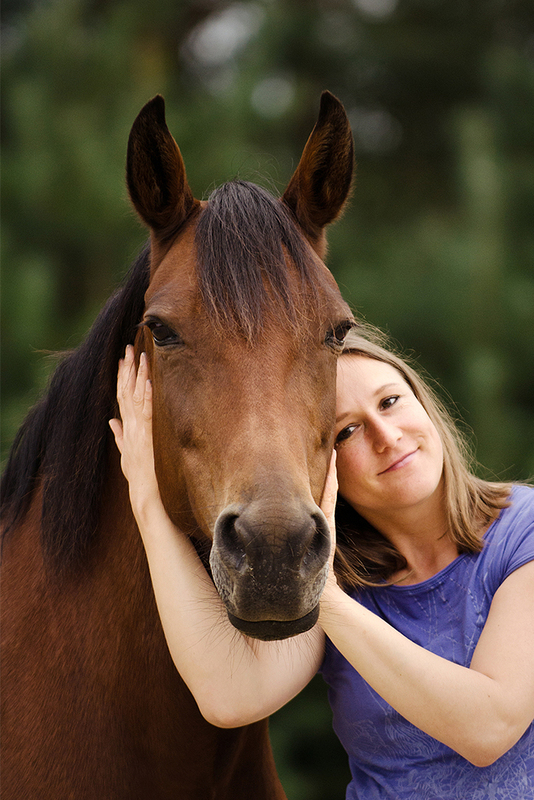 Yet, we believe that our relationship and time we spend with horses should not be characterized by this motive alone. We do not see ourselves as teachers who want to teach the horse something but we want to leave many of the horse’s capacities, habits and personality traits just the way they are. We do not want to take the role of parents for our horse if we aim to enjoy a shared life with a strong, independent and grown-up personality. Of course, the horse is constantly learning, and we cannot avoid that it is changed through this experience, that it follows our actions, and that we both transform ourselves in the course of this process; just like we were not the same a few seconds ago as we have become now while reading this sentence. In my opinion, the way I use a certain method and the role I take towards the horse make a big emotional difference. 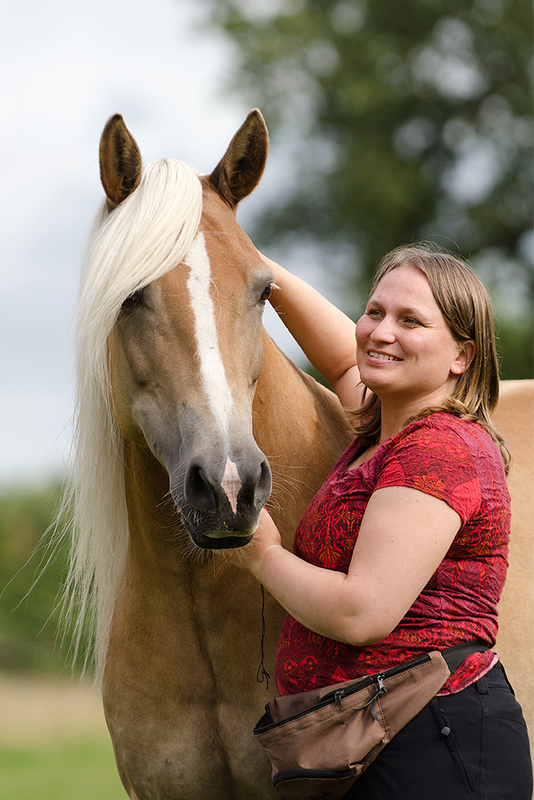 In general, human beings are trainers, or “teachers”, in typical training situations during the course of clicker sessions while the horse takes up the role of a “trainee” or student, and is therefore thought to learn something. Yet, the result of successfully owning a “trained” horse cannot always be seen in a positive light from our point of view. Where do you see yourself in this relationship? Eventually, this single basic assumption of many clicker trainers leads to very distinct roles between humans and horses. The trainer mentally elevates him- or herself in a way over the animal because the trainer manages the learning path, controls the situation, and makes decisions on behalf of the animal if necessary. It easily happens that the trainer only follows the constructed way, and is not moving away from it because he or she cannot realize that real life is not a one-dimensional line. Only if we are willing to change roles it will become possible to meet the partner horse on an equal footing. In doing so, we allow our horse to influence the moment and thereby also to influence the way we are going to take through life. An alarmingly large number of clicker trainers are apparently not able to question themselves and react to their horse’s attempts to communicate. In a way they emotionally seclude themselves from the horse and thereby allow that this fantastic method degenerates into an instrument of one-sided dressage. They selfishly operate this lever in order to realize their personal ideas by the means of the horse’s body. Clicker training as philosopher’s stone? In one way or another, we are all searching for a philosopher’s stone, a magic wand, or a good fairy; for something or someone to grant us wishes and solve our problems without side effects and disadvantages, something that brings about only good things, and helps us to reach our dreams together with our horse. Many of us have hoped to find it in the method of clicker training. Just a mechanism of action? Yet, like with so many things in life clicker training also has its dark sides and is not always only positive. Simply put, it is just a mechanism and therefore affects the horse in a positive or negative way depending on the human being’s understanding of how to use this method and on his or her way of responsibly applying it. Only by telling ourselves that everything will be fine, and, to put it bluntly, by feeding treats we cannot guarantee that the path of learning, the aims we pursue and the end result we want to attain will be perceived as stress-free by the horse. I wrote this text in order to inspire all of us clicker enthusiasts to keep questioning ourselves, to position ourselves in relation to others, to not condemn people who think in a different way, and to make the best of one’s own possibilities. From my point of view, it is not very useful, and not useful for our horses at all, if we immerse ourselves in trench warfare over the best method, the “most correct form of training” or the right role models. Eventually, every method can be used for abuse if only the method and our expectations count, and if we do not respect the horse’s needs and interests. We all find ourselves on unpaved ways to this day, and our occupation with all the different perspectives of positive reinforcement is a never-ending process and a big challenge for us. 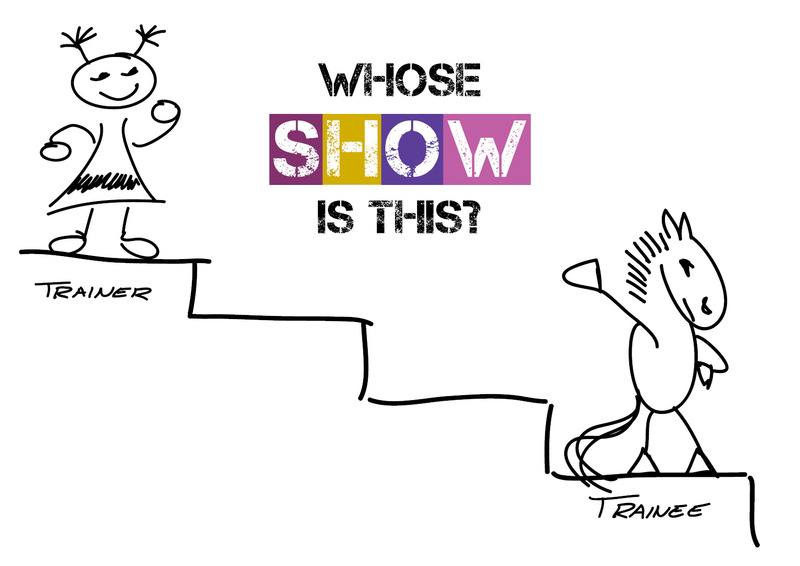 Each and every one of us will progress through distinct stages, and will likely question things that have been considered practical and positive a couple of years ago or would act differently in another context. Don’t we all want the same? Decisions in life are complex; what can be right and make sense at one moment in time can easily be a step in a problematic direction for someone else. So apparently, the possibilities of execution remain a matter of dispute even if we agree to use positive reinforcement as much as possible. 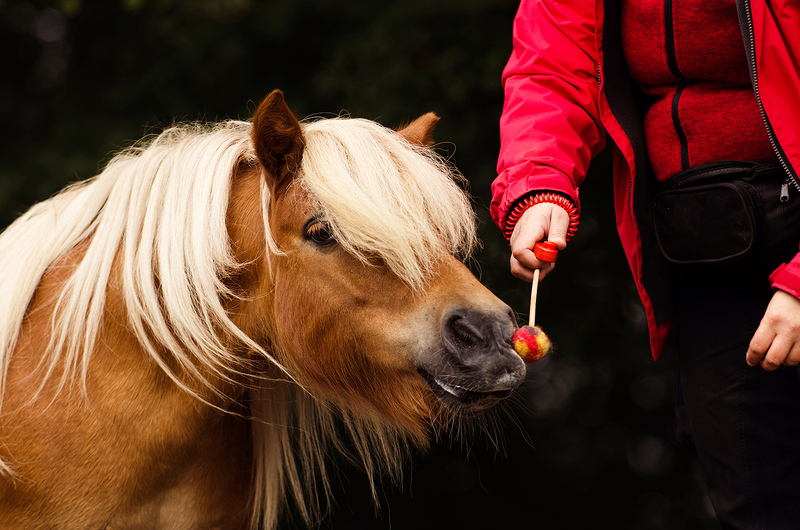 While some would never even think of using a management measure like using a riding arena or a halter with lead, it is out of question for others to lure and entice the horse because, strictly speaking, all of these ways leave the realm of positive reinforcement. Nobody is perfect, and to all one’s shortcomings, lack of knowledge and poor capacities we add an animal’s own needs, strengths and weaknesses. So, everyone can only progress in one’s own pace, and find the “best” or most practical way according to one’s own possibilities. As a rule, this works best if we do not spend so much energy on elevating ourselves above persons who think in a different way, and on fighting with them about distinct points of view. Therefore, it is a good start to get to know as much as possible about other training methods, to think about their origins, advantages and disadvantages , and to reflect upon possible situations in which they could be used in a sensible way for the own team. Another approach can be to deal with the “opponents’” (or critics of positive reinforcement) arguments but also with their reproaches. For me, it is part of a self-critical life not to declare other horse lovers incompetent as a whole, and to not simply dismiss their arguments; instead I try to see things from their perspective. It might even be that the kind of criticism that annoys me the most and hurts me deeply contains a grain of truth I have not had the courage to face so far. Yet, it might be beneficial to face this part of my personality as well, even though I might have successfully ignored this specific source of criticism until now. We sometimes gain valuable insight into our own philosophy of life and our rather subjective capacity to perceive in the shadiest places. This enables us to lead an authentic life according to our ideas, and to face justified concerns and fears in the course of it. These insights can partly be found in the reproaches and devaluating remarks of other methods’ representatives. We can learn to understand and counter their arguments, and maybe we can thereby inspire other people to question their convictions too. A true dialogue is only possible if we listen to each other, if we honestly take others seriously, and if we sincerely want to understand the other. And it is only this dialogue with other human beings that will support us to truly understand the force of positive reinforcement with our hearts, and to set an example with our lives.